My Aunt Mary Anne sent me this old photo from 1974 (or '75? ), and noticed that I had posted it to Flickr last week. 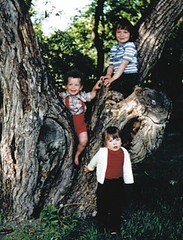 That's me propped up in the V of the tree trunk, with my cousins Lloyd (above) and Conrad (below). These guys were our total buds growing up -- partners in crime and creators of every flavour of fun. I remember my mom breaking it to us in our pre-teen years that we might not always be best friends with them, and we were in total disbelief. At that point, we had no frame of reference for a world in which the four of us wouldn't be forever tearing along backroads north of Niverville at 50 mph, all piled onto their poor old Big Red three-wheeler as if that was a safe and viable way to get around.